For the past four months the families have been asking to meet with their relatives who remain captive inside the camp. The families have established a small camp of their own to out-wait the Mojahedin’s stubborn refusal to comply with their simple request. The families are cheerful and optimistic. 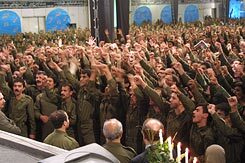 They are being encouraged and facilitated by the Iraqi authorities, who also want the Mojahedin to comply with demands of the Iraqi Government. The Mojahedin have accused these families of being ‘agents of the Iranian Intelligence Ministry’ who have come to kill them. Rajavi has indoctrinated his followers with fear and loathing of their own mothers and fathers. Of course, the work of dissolving a mind-control cult is not easy. Cult experts would agree that the two groups of people who most threaten the leaders’ control over members’ minds are the ex-members and the families of current members. This is no different in the case of the Mojahedin-e Khalq. Having been pushed into a corner by the revelations of the ex-members, the cult now faces the absolute determination of these families to achieve their aim. The families will stay at Camp Ashraf until they have freed their children. 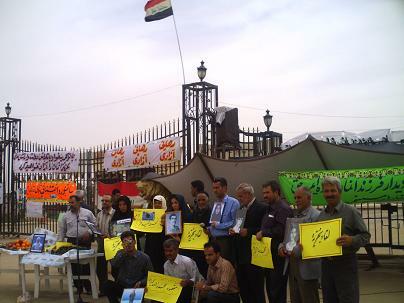 BAGHDAD - Iranian families, who travelled from Iran and other countries four months ago to sit in front of the headquarters of the Iranian Mojahedin-e Khalq in Diyala province (Camp Ashraf), called on the United States Ambassador in Iraq, Christopher Hill, to intervene and put pressure on the organization's leaders to end their suffering and allow them to meet with their children, who have been detained within the camp since the 1980s. In an Open Letter, a copy of which was also distributed to our agency in Iraq, the families demanded the U.S. ambassador in Iraq help with intervention and dialogue with leaders and officials of the [Mojahedin] organization, to allow the families free access to their children outside the walls of the camp in the same way that the three U.S. mothers were able to travel to Iran recently and meet their three children (Shane Bauer, Sarah Shourd and Josh Fattal) who are detained there. The families expressed the hope that the involvement of Ambassador Hill and the U.S. government with leaders of the organization, would create a serious and positive end to their suffering and enable them to meet their children, detainees at Camp Ashraf. بغداد (إ ب ا)- طالبت عوائل ايرانية قدمت من ايران والمعتصمة منذ اربعة اشهر امام مقر منظمة خلق الإيرانية في محافظة ديالى (معسكر اشرف), طالبت سفيرالولايات المتحدة الامريكية في العراق كريستوفر هيل بالتدخل والضغط على قادة المنظمة لانهاء معاناتهم ولقاء ابنائهم المحتجزين داخل المعسكر منذ عقد الثمانينات من القرن الماضي. وطالبت العوائل المعتصمة في رسالة مفتوحة وصلت وكالة العراق بيتنا نسخة منها وجهتها للسفير الامريكي في العراق التدخل والحوار مع قادة ومسؤولي المنظمة المذكورة للسماح لها بمقابلة ابنائهم بحرية خارج أسوار المعسكر أسوة بالعوائل الأمريكية الثلاث التي زارت ايران مؤخرا ً وتمكنت من اللقاء بابنائهم الثلاثة (شون باور، سارا شورد ، جاش فاتال) المعتقلين هناك. وجاء في نص الرسالة "السيد هيل: لقد رأينا بان الحكومة الامريكية قد نجحت وعلى اساس انساني بترتيب ملاقاة الامهات الامريكيات مع ابنائهنّ المعتقلين في ايران، واذا تمكنت امريكا من تحقيق مثل هذه المفاوضات مع الحكومة الإيرانية، نتوقع منكم امكانية التفاوض مع هذه المجموعة الارهابية الصغيرة واستحصال الموافقة للقاء بأبنائنا الاسرى المتواجدين في المعسكر بكل حرية". LONDON, May 19 (UPI) -- Iranian families called on U.S. officials in Baghdad to broker visitation rights to Iranian dissidents encamped in their Diyala province enclave. Members of the dissident People's Mujahedin of Iran are lodged in their Camp Ashraf enclave in Diyala province. The PMOI opposes the clerical regime in Iran. Washington lists the group as a terrorist organization for its violent methods of opposition, though the group surrendered its weapons in 2003. 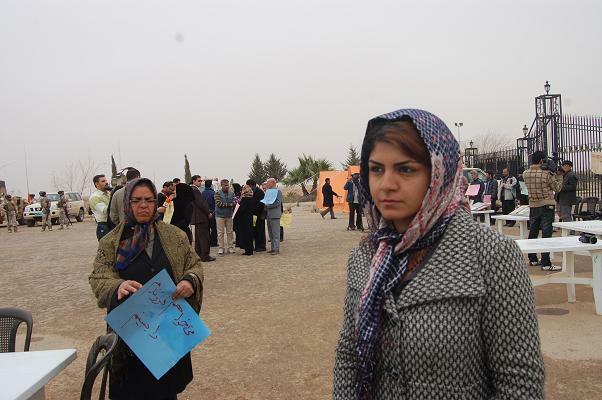 Iranian family members of Camp Ashraf residents called on U.S. Ambassador to Iraq Christopher Hill to award them the same rights that U.S. family members have with American hikers detained in Iran since July. Family members of the hikers are expected Wednesday in Tehran. 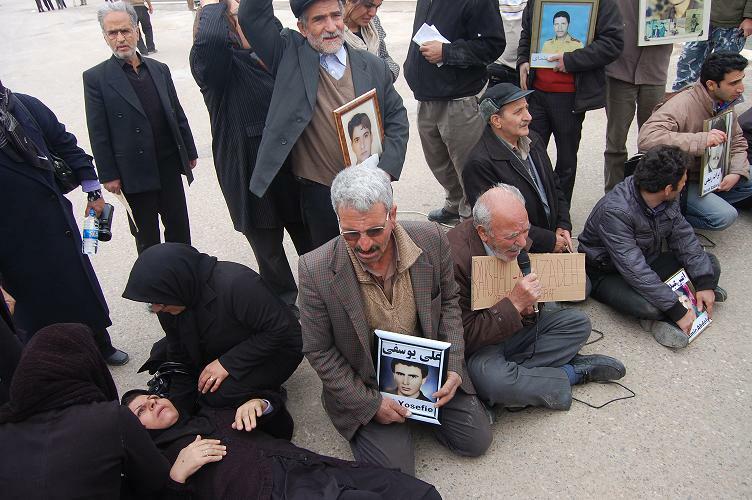 The PMOI family members say their relatives are held captive in Camp Ashraf, adding if Washington can broker an agreement with Iran, similar arrangements are possible with the PMOI. "If America can negotiate this with Iran, we certainly expect that you can negotiate with this small terrorist group so that its members can meet freely with their families," the families said. 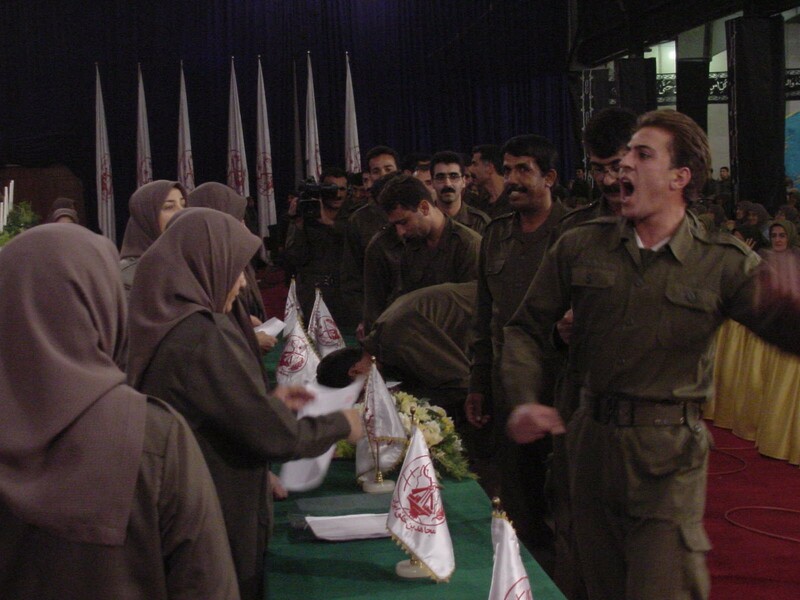 The PMOI is included in the Iranian opposition movement the National Council of Resistance to Iran, a French-based group that considers itself the Iranian Parliament in exile. It denies the cult and terrorist categorization, claiming its policy is based on peaceful dissent. A group of Iranian families today asked the U.S. Ambassador to Iraq, Christopher Hill, for his help in negotiating with the Mojahedin-e Khalq Organisation (aka Rajavi cult, MEK, MKO, PMOI, NCRI) to give visiting rights to the detainees in Camp Ashraf in Diyala province. The parents of captives in Camp Ashraf were responding to news that the mothers of three young Americans detained in Iran, Shane Bauer, Sarah Shourd and Josh Fattal, are on their way to visit their children in prison there. They said, "We are so happy for these families that negotiations with Iran have resulted in allowing these visits on compassionate grounds. Everyone in the world knows the strength of the bond between parent and child. We hope they will achieve their wishes in Iran." For nearly four months the families have been encamped outside the camp which houses members of the Mojahedin-e Khalq terrorist cult. The cult leaders refuse to allow ordinary members to have any contact with the outside world and will not negotiate with external bodies. Some members have been trapped inside the camp for over twenty years. Although the Government of Iraq is responsible for the camp, officials say their hands are tied because the MEK have powerful backers in Washington, even though it is on the U.S.'s own terrorism list. The families told Mr. Hill, "We witnessed ourselves that American soldiers intervened on behalf of the MEK leaders when Iraqi soldiers tried to help us get inside the camp." Urging Mr. Hill to intervene on their behalf with the leaders of the MEK the families said, "Your government successfully arranged for the mothers of U.S. detainees in Iran to visit their children on compassionate grounds… But, if America can negotiate this with Iran, we certainly expect that you can negotiate with this small terrorist group so that its members can meet freely with their families." 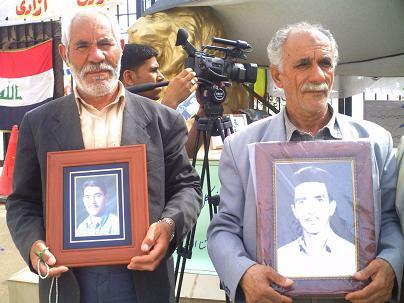 We are Iranian families who have travelled to Iraq to find relatives enslaved by the Mojahedin-e Khalq organisation (aka Rajavi cult, MEK, MKO, PMOI, NCRI) in Camp Ashraf. We families have been encamped outside the gates of Camp Ashraf for nearly four months now, and still not been helped enough to meet with our relatives. We now have news that the mothers of three young Americans, Shane Bauer, Sarah Shourd and Josh Fattal, detained in Iran are flying over there to visit them in prison. We are so happy for these families that negotiations with Iran have resulted in allowing these visits on compassionate grounds. Everyone in the world knows the strength of the bond between parent and child. We hope they will achieve their wishes in Iran. 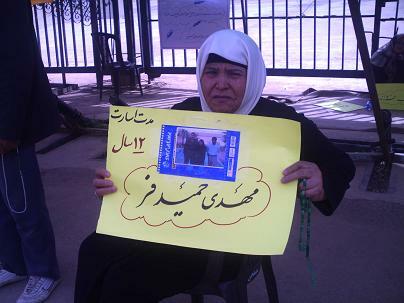 We share the same anguish as these three mothers, with the difference that our children have been held captive in Camp Ashraf for over twenty years, not by the Iraqi government but by the very leaders of the group they are with. And conditions inside Camp Ashraf are worse than any prison; our children are not allowed to telephone or even to write to their families, they have been enslaved. 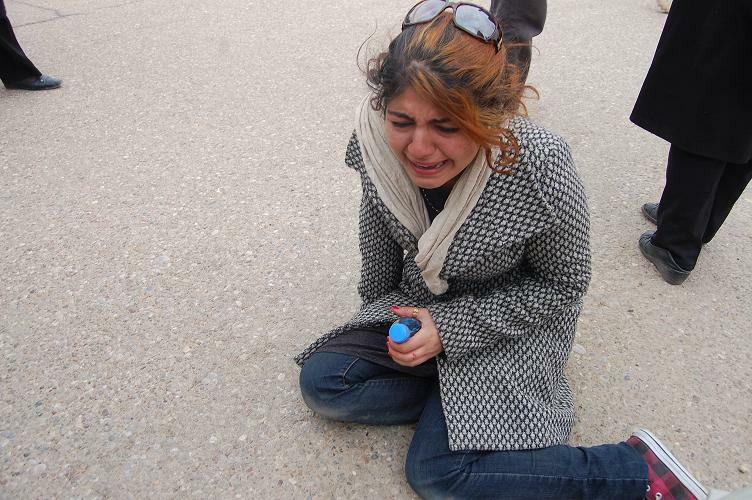 Up until 2003 we could not approach the camp where our children live because the Mojahedin-e Khalq were armed. We became hopeful when U.S. Forces disarmed the group and rounded them up into one place. At last there was hope of visiting. But the U.S. Army failed to get the group to surrender, even though it is on the U.S.’s own terrorism list as well as being a foreign terrorist group in Iraq. Even when we travelled to Iraq to find our children, the U.S. Army did not help us. Those few members who were lucky enough to meet their families always had MKO minders with them to prevent them from escaping. When the Government of Iraq took control of the camp in January 2009 we again had hope that we could visit our children. But the MEK leaders refuse to cooperate and have not only kept the gate locked but threatened us with violence if we don’t leave. Now the Iraqi government is doing what it can to help us, but for almost four months we are still stuck at the entrance gate without news. Over these four months we have talked to everyone we can; UNAMI, the Red Cross, human rights groups, Diyala tribal leaders, Iraqi and foreign press, Iraqi government officials and the military personnel responsible for the camp. In private we have been told over and over again that the Iraqi government cannot do more to help us because the Mojahedin-e Khalq has powerful backing in America (where it is on the U.S. terrorism list). 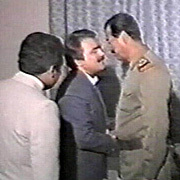 We witnessed ourselves that American soldiers intervened on behalf of the MEK leaders when Iraqi soldiers tried to help us get inside the camp. Now we are finally convinced that no one but America has control over this group - and even then we see that the tail is wagging the dog. Your government successfully arranged for the mothers of U.S. detainees in Iran to visit their children on compassionate grounds and we wish them every joy that such a meeting must bring. But, if America can negotiate this with Iran, we certainly expect that you can negotiate with this small terrorist group so that its members can meet freely with their families. The report approved the fact that despite the dissemination of Mojahedin and inviting mass media to camp Ashraf, the organization has so far refrained to welcome the reporters’ presence and answering their questions. Instead, it refers to the gathering before the camp as a propaganda show staged by the Iranian regime and calling people and reporters Intelligence Ministry agents swarming at the front gate of Ashraf by the collaboration of the Iraqi Prime Minister’s Office. The report has some shocking scenes illustrating the oppression and injustice of Ashraf high rankings imposed on MKO victims, their families and children and focuses on the gap separating Ashraf from the family of its residents as well as the baseless claims of Rajavi on the point that Ashraf residents have remained there at will and its doors are open for those willing to leave and other lies fabricated by him for killing time and victimizing more members. There is no need to interpret the tearful eyes of an eight-year-old girl who has never seen his father since she was born. The BBC report contains justifiable and significant points to convince the global community, international humanitarian institutions and mass media to be concerned about the blatant violations of human rights and international rules by the leaders of a blacklisted terrorist cult that respects no convention, law and domestic legislation. Here are some suggestions that may well help avert further violations of human rights by the organization and possible release of the enslaved members. 1. The international organizations are supposed to send their independent delegates to Iraq to be informed of the events inside and outside Camp Ashraf directly if they ever care for human rights and justice. It may prevent victimization of more MKO members used as human shields in Ashraf. Mojahedin advocates can make a descent visit of camp in order to get at the truth. 2. The Iraqi Government has done its best in order to prohibit any human disaster inside Ashraf. It is the best position taking on the part of the government after the bloody conflicts of June 2009 in proving its goodwill toward Ashraf residents. According to BBC report, the Iraqi police are just trying to preserve order in the region maintaining neutrality, yet Mojahedin leaders insist on developing a violent atmosphere by means of assaulting and battering the family of Ashraf residents located beside camp. The best solution at the time being seems to be the direct interference of international organs and bodies; otherwise, any negligence in this regard may result in negative consequences that in no way vindicate any concerned organization and body. 3. BBC report reveals that Mojahedin cannot bear the presence of mass media in the region in contrast to their claims. They are well aware that the disclosure of the truth may be a barrier in the way of their propaganda blitz and psychological warfare. Therefore, the continuous presence of the media in the region may foil Mojahedin’s plans. 4. The fact that a number of Ashraf residents escaped from the camp to join their family may reveal that the organization has kept MKO members inside camp by force. The presence of the concerned international institutions may facilitate the free exodus of the captives. Any delay in this regard may impose irreparable costs on the voluntary split of members and encouraging the leaders to continue with the human tragedy ultimatums. 5. The presence of a number of families before Camp Ashraf, that has emboldened some insiders to the escape and also disclose the true notorious nature of Mojahedin, may emphasize the necessity of the presence of other families to save their children. Undoubtedly, Ashraf officials cannot bear the existing conditions forever. As mentioned before, the first step for the dissolution of Camp Ashraf is by rendering the organization helpless through a striking split therein and this is the best time for breaking cultic relations of MKO to set the members free. The supports of the families may pave he way for releasing their children from the firm clutch of Rajavi. 6. The interaction of the families with the media is of a high significance. It may deprive Rajavi of his lever of fabrication and distortion of the truth as well as trying to win the sympathy of the world by putting the bargaining chip in the hands of the families as it was revealed in the blind and hysteric backlashes of Mojahedin against BBC report. In a nutshell, Rajavi and Ashraf high rankings have reached a stalemate and the persistence of the present conditions may lead to their full destruction in the near future.